1/4” B.S.P.T.M. X 1/4” B.S.P.P.M. 1/2” M.E.C.V. X 1/2” B.S.P.T.M. 1/2” M.E.C.V. X 1/2” M.E.C.V. 1/2” B.S.P.T.M. X 1/2” B.S.P.P.M. 1/2” M.E.C.V. X 1/4” B.S.P.P.M. 1/2” B.S.P.P.M. X 1/4” B.S.P.P.M. 1/2” M.E.C.V. X 1/8” B.S.P.T.M. 1/2” B.S.P.P.M. X 1/8” B.S.P.T.M. Use : These are individual fittings for fixing on M.S. Pipeline for obtaining different types of outlets and are used to connect valves, Regulators and any other Fittings on the Pipeline. Size : 1/2” M.E.C.V. X 1/2” F.E.C.V. 3/8' Cu X 1/2” M.E.C.V. 3/8” B.S.P.P.F. X 1/2” M.E.C.V. 3/8' Cu X 3/8” B.S.P.P.F. 3/8” B.S.P.T.M. X 1/8” B.S.P.P.F. 1/4” B.S.P.P.F. X 3/8” B.S.P.T.M. 1/4” B.S.P.P.M X 1/4” B.S.P.P.F. 1/4” B.S.P.T.M. X 3/8” B.S.P.P.F. 1/4” B.S.P.P.F. X 3/8” B.S.P.P.F. 1/4” B.S.P.P.F. X 1/4” B.S.P.P.F. Use : There are individual fittings for fixing on M. S. Pipeline for obtaining Different types of outlets and are used to connect Valves, Regulators and any other fittins on to the Pipeline. 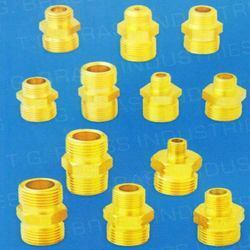 Since start of our business, we are successfully offering an excellent quality assortment of High Pressure Adopters. 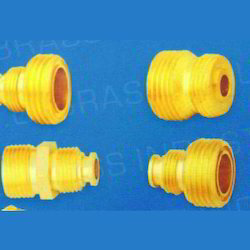 Widely used in high pressure fluid applications, the offered adaptors are made available in different shapes and sizes. 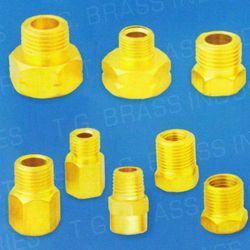 Our offered parts are precisely manufactured under the vigilance of our ingenious professionals by utilizing the best grade brass and contemporary techniques. Additionally, our valued clients can purchase the offered adaptors at thrifty rates from us. 1/2" M.E.C.V. x 1/4" M.E.C.V. 3/8" Cu x 1/4" M.E.C.V. 1/2" M.E.C.V. x 1/2" B.S.P.P.M. Use : These Adapters are having multi point licking system & built-in Non-return valve. They release gas at unreduced pressure. Compact Valve Adapters are Used For Connecting S.C. Valve Cylinders To Pigtails.